The Modern Dimensional Control Methods in Shipbuilding and Repairing Seminar was held at the Neva 2015 Exhibition. Speakers talked about dimensional control best practices at shipyards and shared the principles of their successful implementation. 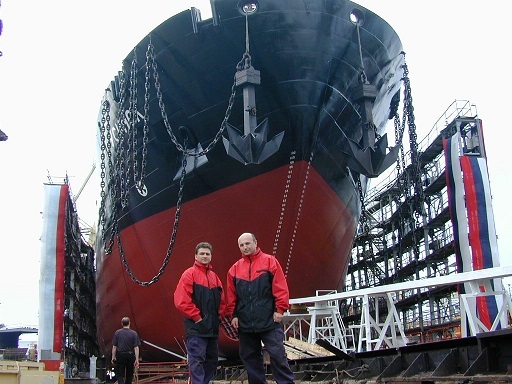 Read on to learn how the Bum Techno engineers use SpatialAnalyzer to improve efficiences in Russian shipbuilding. The Modern Dimensional Control Methods in Shipbuilding and Repairing Seminar was held at the Neva 2015 Exhibition. Speakers talked about dimensional control best practices at shipyards and shared the principles of their successful implementation. He also pointed out that traditional measuring methods and instrumentation such as well-known levels, plummets, and measuring tapes have poor accuracy. In contrast, Bum Techno uses measurement technologies that embrace the advantages of electronic theodolites, tacheometers, laser trackers, scanners, and other devices. "We created a coordinate measuring machine using special metrology software like SpatialAnalyzer. The equipment is mobile, enabling high-quality measurement solutions,” he added. Hull, machinery, and systems can now be measured to the accuracy of a tenth and a hundredth of a millimeter; and well-proven technologies and methods ensure quick performance. To demonstrate the coordinate measuring method, Bum Techno engineers simulated the final assembly of the hull made of neat-cut sections without tolerance. A MAERSK container ship model was used as an object, with measurements taken by a portable arm and optimization calculations made using SpatialAnalyzer, which creates relationships between 3D engineering models and the real object (in this case the container ship model). "By establishing the relationships and launching the optimization process, we minimize them, place our object, and check its assemblability. Any collisions or deviations from the 3D model can be seen on the monitor and the necessary improvement measures can be taken," said Vladimir Doubynka. Nicolas Tanala, European Business Manager for New River Kinematics (the developer of SpatialAnalyzer), highlighted the software features and advantages. "Our software is mainly used in aerospace, shipbuilding, energy, and automotive industries. We focus on calculating the manufacturing error affecting the product geometry that determines its technical characteristics,” he said. He maintains that the use of cutting-edge technologies based on the coordinate measurements for assembly can significantly save time and money. "How is the cost of the ship component (hull section, machinery) calculated? The initial cost of the component is based on the costs of manufacturing and trials at the plant. Should some improvement be required while the component is still at the plant, the cost increase is rather small. However, there may be problems once the component has left the plant. Should a geometry problem be detected, the cost will significantly increase. The worst-case scenario is when the customer refuses to accept this component,” commented Nicolas Tanala. "We and Bum Techno aim to minimize the price. Measurements are key to determining whether improvement is required at the place manufacture, thus preventing the cost increase,” he said. It is noteworthy that using SpatialAnalyzer measurements can be recorded from the start of construction. By identifying the value of error, one can minimize it and make measurements more accurate. Nonetheless, not all shipyards can build ships using cutting-edge methods. "Everything is simple. The section is manufactured with 30-50mm fitting allowance and brought to the one previously mounted, the cutting line is marked as an assembly cut and the section is cut, hereupon the sections are fitted. This is carried out during the staple period, therefore adding to the cutting time. This is unnecessary work,” said Vladimir Rogozin, Chief Process Engineer for JSC Admiralty Shipyards. He also stated that coordinate measuring methods and new electro-optical technique enables them to change the control technology, improve the accuracy in the manufacturing process, and monitor the alignment of units in real time, thus reducing the extra work when fitting on the staple. 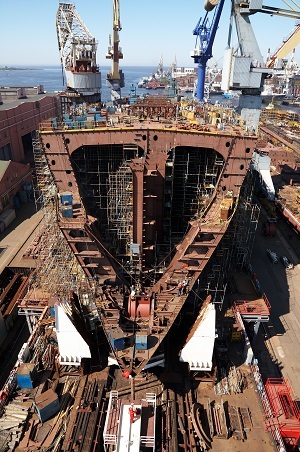 According to Alexander Derevyannyh, Manufacturing Engineering Supervisor for JSC Admiralty Shipyards, the attempts were made to finalize sections on the slipway rather than at the place of manufacture at the early development stage of neat-cut technology. This method was rejected due to high costs of eliminating inconsistencies; consequently, sections are now adjusted to the required geometry at the manufacturing shop. As part of the seminar, Bum Techno engineers, Alexander Andreev, Yury Genrikhson, and Alexey Zimbalevskiy, also presented their reports on dimensional control best practices at various stages of shipbuilding and ship operation. Bum Techno specialists make precision measurements and develop dimensional control solutions for shipbuilding, aerospace, radio-astronomical, heavy engineering, and automotive industries. 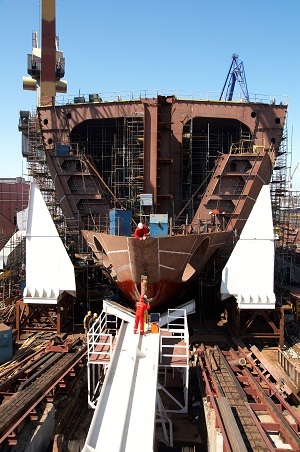 Bum Techno cooperates with Admiralty Shipyards, Sevmash, Zvyozdochka, Baltiysky Zavod, and other shipbuilding companies. 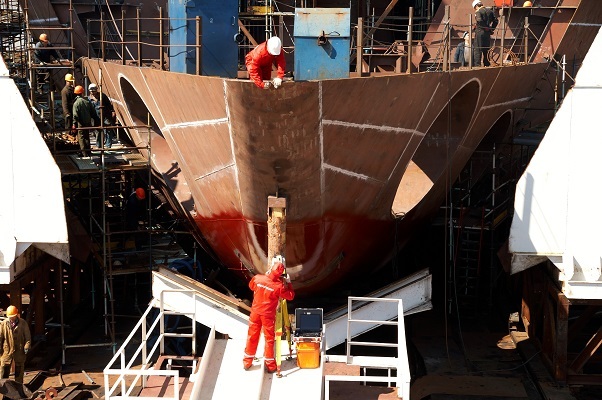 Technologies based on coordinate measuring methods using electro-optical and laser measuring systems, laser scanning, and 3D simulation make it possible to speed up and optimize the manufacturing cycle as well as enhance the dimensional control quality at all shipbuilding stages.